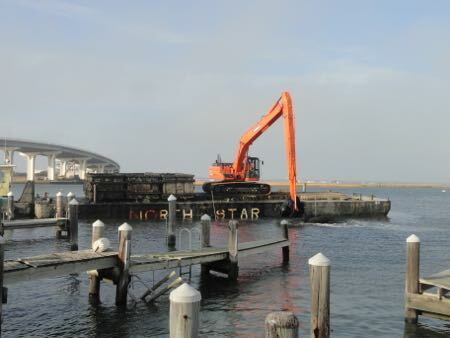 A lone excavating machine is continuing its quest to remove 14,000 cubic yards of mud from the floor of Snug Harbor (between Eighth Street and Ninth Street) in Ocean City. An excavator scoops mud from the mouth of Snug Harbor on Friday, Nov. 6. Less than six weeks remain before the expiration of a permitting window after Dec. 31. “It’s moving much slower than we’d like,” Ocean City Business Administrator Jim Mallon said. Snug Harbor offers one of the most extreme examples of the silting that makes much of Ocean City’s bay side unnavigable at low tide. The lagoon there is completely dry at low tide. The city has committed funding to deepen lagoons and channels, but it has been frustrated by environmental regulations that prevent Ocean City from creating new sites to dump dredged material. In the case of Snug Harbor, the material is being taken by barge across the channel to an area under the Ninth Street Bridge where it is being hauled away by truck. But Mallon said the material is not drying out as quickly as anticipated, slowing down the entire process. An effort to remove material by barge and truck from a separate disposal site near Roosevelt Boulevard is also proceeding slowly. Meanwhile, neighbors of the Snug Harbor project area suggest the work is only making silting worse in front of their properties — particularly as a tug tries to plow the barge through extremely shallow water. Robert Jones, a resident of the Bay Bridge Condominiums at the foot of the Ninth Street Bridge, said he and his neighbors are compiling videos of the work (see above) and its effects on their property. City Council in August awarded a $937,900 contract to Wickberg Marine Contracting of Belford, N.J. to complete the job at Snug Harbor. The project will make Snug Harbor six feet deeper from the Bay Avenue bulkhead to a 150-square-foot box outside the mouth of the lagoon (leading to the channel).